Bulgaria is a great destination for ski holiday. And it is affordable. It is especially attractive for families to enjoy a winter family ski holiday. We tailor the ski holiday to your specific requirements. We will be glad to offer our experience and local knowledge to organise the ideal winter holiday for you. Ski teambuilding: for companies we organise fun and exciting ski team building events with ski and snowboard, off-piste snow activities and apres-ski entertainment. Ski in Bansko: Bansko is Bulgaria’s biggest ski resort. It regulalrly hosts international ski championships. It offers good ski facilities for all levels of experience as well as great off-piste and apres-ski fun. Snowboard in Pamporovo: Pamporovo is Bulgaria’s young and fun ski and snowboard resort. 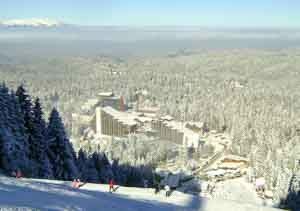 It is the leading snowboard destination in Bulgaria. In the evening there are regular snow parties and international DJs performing throughout the winter season. Ski in Borovets: Borovets is a good destination for families. There are many off-piste activities such as winter horse riding and horse sleighs.